There's probably a good chance that you've never heard of the Chicago indie rock trio Sunshine Boys or even their debut album, Blue Music, which was recently released under the radar. Then again, when you're a relatively unknown group competing with other higher-profile releases by Cardi B, Kacey Musgraves, Jack White, and the Weeknd, getting your first record noticed seems like an uphill climb. But both Sunshine Boys and Blue Music are worth discovering if one takes the initiative to seek them out. And the payoff is worth it. 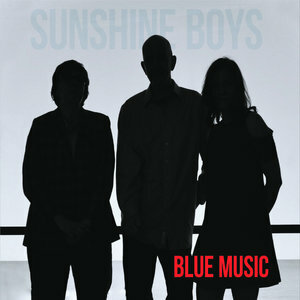 Sunshine Boys is an indie rock supergroup consisting of singer/guitarist Dag Juhlin (the Slugs, Poi Dog Pondering), bassist Jackie Schimmel (Big Hello, Justin Roberts), and drummer Freda Love Smith (the Blake Babies, the Mysteries of Life). The special chemistry that they share is apparent from the opening notes of Blue Music's leadoff track "Questions", which reveals the group's sonic ingredients: shimmering guitar; punchy and smooth rhythm playing on the drums and bass; catchy melodies; passionate singing; airy harmony vocals; and crisp and sterling production. Track after track on Blue Music is a power pop lover's dream as the songs verge between anthemic-sounding numbers like "Tripping Through Time" and the title song, and somewhat reflective tracks such as "There Goes Another One", "Save It for a Windy Day", and "Glider Pilot". And yet despite the music sounding upbeat, the lyrics are very introspective; some of the songs explore life's trials and tribulations, while others are very impressionistic and observational of one's surroundings. As Juhlin's explained on the band's website: "I spent a couple of days recording some of these demos in the family cabin on scenic Perch Lake [in Michigan]. It was kind of a golden week, and so much of our early material sprung from that trip. I suppose that explains a lot of the wind/sun/water references that seem to appear throughout...Other things factored in, too: the death of my Mother, the graduation of my son from high school, and just the general state of the world." Those experiences lend something personal to the songwriting: whether it's about coming-of-age or a personal awakening like on "Billy Boy" and "Tripping Through Time. The dramatic "Schoolyard Bully" could be interpreted as a commentary about today's fractured society and government (maybe even about you-know-who in the Oval Office), and "Only a Million Miles" also feels both timely and topical. Meanwhile, "John Cage" references to the famed American avant-garde composer and even the lyrics reflect Cage's ideas: "In sound is epiphany / In silence a symphony." Poignant moments are also evoked in "Save It for a Windy Day" and in the title song, the latter sounding like a paean to the disaffected. The final track, "Sign of Life", conveys an assurance to those who feel a tenuous grasp on their lives and reality, but it also implies that going through obstacles is what makes us alive and human—a very hopeful and comforting note to conclude the record on. Had Blue Music been released 25 years ago at the height of the alternative music explosion, it could've been a surefire hit; sonically the album really evokes that period in the 1990s. But beyond commercial aspirations, it's clear from listening to the album that this was a labor of love for all the participants involved; Schimmel and Smith's bass and drum work respectively provide the steady counterpoint to Juhlin's soaring guitar playing and heartfelt vocals. The result by these veteran musicians is something quite gorgeous and elegant. Blue Music might go unnoticed by most people and critics, but for the few who actually do listen to it, the resulting experience is special.